Apricots that are fully ripe are so fragrant and delicious. It’s such a treat to have them for breakfast like in this delightful overnight porridge spiced with cardamom and ginger. Soak the oats a day ahead and serve them cold with fresh fruits. 1. Pour the milk, oats and shelled hemp into a container or jar. Close the lid and shake well. Cover and leave in the fridge overnight. 2. When ready to use, add the ginger and cardamom seeds. Mix together. 3. Share evenly between two bowls. 4. 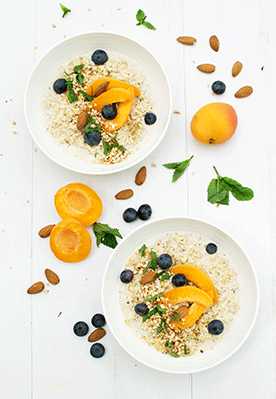 Top with sliced apricots, blueberries, whole almonds and toasted almonds.